hide show How do I configure the app settings? Open the app and then press your menu button, and then select settings. hide show Can I use voice feedback? Only if your mobile is running Android 1.6 or later. If you cannot hear the feedback make sure you have TTS (Text to speech) installed. hide show What is the Responsiveness setting? You can choose a balance between the responsiveness of the app to speed changes and the smoothing of speeds in your track. For slow sports such as running or walking choose Max Smoothing to reduce the speed spikes in your track. For high speed sports choose a higher responsiveness setting. hide show How are calories calculated? Calories are calculated based on your body weight, your sports category, average speed and track duration. If you are using a heart rate monitor then the calories are calculated based on your heart rate. hide show How are my heart rate zones calculated? Your heart rate zones are based on your age. You also have the option of using the Karvonen formula if you know your maximum and rest heart rates. hide show What does pause do? If you select to pause then the app stops recording track points until you resume your track. When you resume your track will continue with your total elapsed time. If you have moved while the app was paused this distance and speed will still be included in the track. If you were moving less than 2kph (on average) during the pause then the pause will not have affected your moving time and average moving speed. hide show How do I record indoor training? You can use the Sensor only mode and use bluetooth, bluetooth Smart or ANT+ heart rate, bike and footpod sensor(s). hide show How can I update Facebook/Twitter? Facebook and Twitter are updated automatically when you start, finish or beat a personal best. You can configure your settings here. You can choose what to include in the track finish status update from distance/time, average speed, max speed, max heart rate, calories or choose for a random update from that set. hide show What if I cannot get a satellite signal? Make sure you are outside away from buildings with a clear view of the sky. If after a couple of minutes you still have no signal at all then reboot your phone and try again. If you cannot get enough signal e.g. you are stuck on a marginal signal then you may reduce the signal threshold in the app settings. hide show Is the app purchase a one off payment? Google Play purchases get linked to your Google account. As long as you use the same Google account when you transfer to another phone - all your paid apps can be re-installed for free from the Google Play. If you have entered a different Google account then you would need to purchase again, then inform us and we will cancel/refund your original order. If you paid by PayPal just enter your login in the free app to unlock it. Try going to your phone settings > applications > manage applications > find and tap on Google Play > tap "force close" and on "clear data". Relaunch the Google Play, press menu > my apps > install SportsTracker Pro from the list. hide show What is Sportstracklive? Sportstracklive lets everyone share their sports track live, in real time from any Android phone (with internal GPS) Or after your activity upload tracks from any GPS unit in GPX, TCX, CRS, HRM or SBN file format. hide show Why use Sportstracklive? Share, compare, train and compete in your sport with fellow enthusiasts and friends anywhere worldwide - live. Review your activity with detailed analysis of performance, speed, pace, altitude, ascents and descents. Replay your tracks at home to see where you've been and how you performed. Use the website as a training log to review your performance over time, your personal bests and compare your performance with others. hide show Can I use my regular GPS unit? Yes SportTrackLive can be used with any GPS model - Just download the tracks to your computer and upload to sportstracklive.com for analysis, replay and sharing with friends and fellow athletes. hide show How can I protect my device for water activities? Mobile phones should be protected using a water tight pack such as an aqua pac. Often stand alone GPS units are waterproof for submersion down to 1 metre for a short period. However they generally cannot survive an impact with water, where they are exposed to high pressures, a common occurence in many water activities. Your unit should be protected from the extra water pressure of an impact by using a suitable case. hide show How should I carry my phone? Sports shops offer suitable cases that may be strapped to the upper arm - this is generally the best position to get a clear satellite signal. Satellite signals are weak and even holding a unit by hand can obstruct the signal. The app is compatible with the Polar wearlink BLUETOOTH version. Charge the HRM or ensure the battery is new. Wet the chest band under a tap where the HRM attaches. Attach the HRM to the chest band and wear the chest band around your chest just below your rib cage. You should be able to pair with the HRM. Note you don't need to do this again. If you cannot pair with your HRM try rebooting your phone and then try pairing via your phone settings instead. Check your mobile bluetooth is enabled or enable the auto start of bluetooth in the app settings. The app is compatible with ANT+ heart rate sensors, see more information here. The bluetooth connection reliability can depend on your phone model, the distance from the HRM to the phone, other bluetooth signals in your vicinity and any obstructions. Bluetooth signals are very weak - only travelling 10m in open air, any obstruction can hamper the signal. Don't hold the phone in your hand, use an armband or other holder. If the connection is lost then the app will repeatedly try to reconnect to the HRM. If you find the app still cannot reconnect then try removing the HRM from the chest band for over 10 seconds and then re-attaching it. Upload from the mobile app by viewing the recorded track and pressing Menu > Upload. Live tracks are uploaded in realtime and can be followed live on the website. hide show How can I add information to a track? Enter a category, location, event and tags for the track in the mobile app. Notes may also be added to the track during the activity or after on the website. You can edit all the details about a track on the website by selecting the edit link in the top section of the track info page. You can edit your general privacy settings by going to My Account > Privacy. You can edit the privacy of one track by selecting the edit link in the top section of the track info page. A spike filter is used to remove speed spikes caused by GPS positional errors. If your track still has spikes you can clean them if you login and view the track info page, then select the clean option in the top section. You can download your tracks in Google Earth KMZ format (for viewing in Google Earth) or GPX format (for importing into other apps or editing) or CSV (comma separated value - sutiable for spreadsheets). Download individual tracks from the track info pages or download all tracks from your dashboard. You can delete tracks if you login and view the track info page, there is a delete option in the top section. You can delete duplicate tracks if you login and view the track info page, there is a delete option in the top section. Login and view the track info page on the website and click the clean option. You can then trim the track time in minutes. If your track is still showing as live but you have finished, it means the request to finish the track failed. It will automatically time out after an hour. Your 5 greatest heart rate increases and recoveries in 1 minute can be charted and mapped. Your overall average speed and pace are given and also your "moving" average speed and pace. Your "moving" average speed and pace only include times when you were moving more than 2kph. Your performance over a set of fixed distances and times is measured and can be charted and mapped. If you break a personal best you will be informed by email. Personal bests are kept for each category you use. The star rating you see along side each performance metric is a comparison to your personal best for that distance or time. The star rating you see for each track is taken from the longest distance performance metric of the track. Your overall maximum speed is calculated and can be mapped. It is of course vulnerable to speed spikes introduced by inaccuracies of the GPS signal. Your 5 fastest 10 second periods and 5 fastest 500 metre sections are also calculated. The average of your 5 fastest 10 second speeds (Ave 10s) is a fairer calculation of your maximum speed since it is less vulnerable to small speed spikes. Your first 50 splits are calculated and can be charted or mapped. A split is either 1km, 1mi or 1nmi (depending on your unit choice). Your 5 greatest ascents and descents in 500 metres of horizontal travel can be charted and mapped. Avoid built up areas. Satellite signals are very weak. Don't keep the phone in your pocket. Your body will block good satellite signal reception. 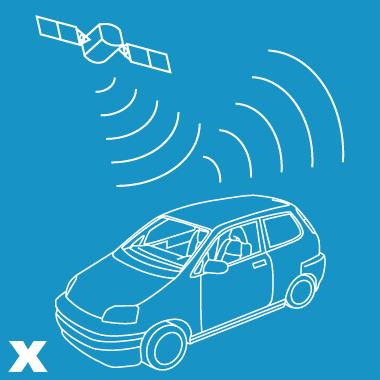 Satellite signals are too weak to penetrate car roofs well. Keep the mobile under the windscreen. Keep the mobile strapped to your upper arm for a clear view of the sky. Satellite signals are very weak. If your track speeds are too high then you have errors (spikes) in your track caused by poor GPS reception. You can perform a manual clean of spikes on the track info page. If one of your tracks has "messed up" your personal bests because it contains errors you have 2 choices. Only tracks that use recognised categories will have valid calorie calculations. If you think the calorie calculation is too low probably your track category is not recognised. Contact support so it can be catered for. Try rebooting your phone, normally this will clear any problem with your phone GPS. hide show Where does the service work? Any where worldwide. To upload live tracks of course you'll need mobile phone reception in that area. hide show What happens if my mobile loses reception? Updates of your full live track will be made as soon as your phone gets signal again. hide show What if the satellite signal is too weak? Tracking will resume as soon as the signal permits. Keep your phone fixed/strapped in a position with a clear view of the sky. 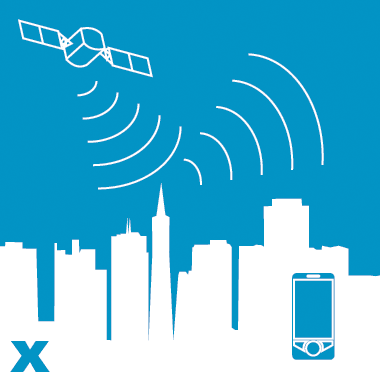 Satellite signals are weak - tall buildings may obstruct/reflect signals. Task killer apps are not necessary and will interfere with the app. Also beware of apps that schedule when your GPS and bluetooth are turned on. If you find a bug report it to bugs@sportstracklive.com, include as much information as possible (phone model, android version, exactly what you are doing and exactly what you see). If the problem creates a "Force close" message, try installing an app from the Google Play called "Catlog", use it to record the log file and send the file with your email. Most GPS issues can be fixed by rebooting your phone. If the message is "Request failed" then you don't have an internet connection. If the message is "Invalid email/password" then you have made a mistake in entering your info. You can reset your password on the website by using the "Forgot password" link on the login form. This app is only as accurate as your mobile internal GPS and is affected by the quality of your satellite signal reception. Satellite signals are very weak, spikes in speed data are caused by poor satellite signals and reflections. Altitude readings are typically +/-50m or worse in accuracy. This is a limitation of GPS altitude readings. The mobile app periodically removes spikes in your track using a sophisticated filter (so you may see your maximum speed drop - if a misreading was caused by a spike). 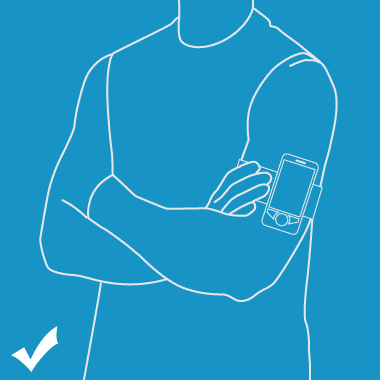 To avoid spikes always carry your mobile in an arm pouch fixed to the upper arm. Spikes are removed both in realtime on the mobile and after your activity on the website. This may mean some of the track statistics (e.g. max speed) differ between the mobile and website. Using 3g and your phones GPS can drain your battery. Make sure your phone is fully charged before you begin. You can swap batteries and resume tracks if you are in offline recording mode. If you need optimum battery life time - and do not need live tracking or to make phone calls - then you could put your phone in airplane mode. This will give the longest life possible. Offline recorded tracks can be resumed with in an hour of them finishing. This can be useful if you are changing batteries. If your account is deleted, then everything you have done will be deleted, including all of your tracks and comments. You can delete your account by logging in and clicking here, this cannot be undone. With optimal conditions horizontal accuracy can be as good as +/-5 metres. Altitude accuracy is typically much worse +/-50 metres is not uncommon. Horizontal Dilution of Precision is a measure of how accurate a positional reading is. The lower the value the more accurate the position. Only tracks uploaded from Locosys GPS units will include this data. Your bearing is a clockwise measure in degrees of your course from due north. Spikes in the track speed can be caused by poor GPS reception which in turn leads to positional errors in the recorded track. You can avoid spikes by keeping the mobile attached to your upper arm, and avoiding buildings and tree covered areas. If you are doing a low speed sport such as walking or running you can also set the app responsiveness setting to the maximum smoothing setting. This will reduce the chance of spikes affecting your track. The app has a realtime spike filter that can remove most spikes but not all. When you upload to the website the tracks are cleaned several times by a more thorough spike filter. If you find spikes still remain you can do a manual clean by selecting the option on the track info page. If you didn't record your workout but know the distance and time you can manually create your activity by clicking create in the top menu..
Upload .tcx or .crs files to include heart rate and cadence data. Upload .hrm and .gpx files to include heart rate and cadence data. Upload .sbn files to include doppler, hdop and satellite data. Upload .csv files to include heart rate data. If you don't have software with your unit to download tracks on to your computer we recommend using GPS TrackMaker. Save your file in GPX format. Ideas, comments, suggestions or feature requests?